TASTE is a development environment dedicated to embedded, real-time systems and was created under the initiative of the European Space Agency back in 2008, after the completion of a FP6 project called ASSERT. TASTE can be used to design small to medium-size systems; it relies on formal languages and is based on the idea of building "correct by construction" software. The key technologies used in TASTE are AADL, ASN.1 and SDL. TASTE target safe systems and promotes the use of Ada for coding activities. TASTE allows software designers to easily integrate heteregeneous pieces of code produced either manually (in C or Ada) or automatically by external modelling tools such as MATLAB Simulink, SCADE, or Real-Time Developer Studio. 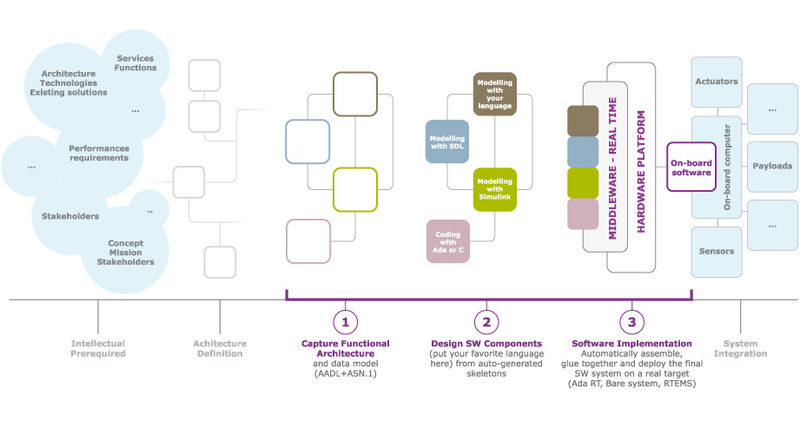 By using TASTE, a software system architect can easily produce a complete and homogeneous system in three steps as depicted by the following figure (see below). Support expandability of features through openness to external tools. Copyright © 2019 European Space Agency - All rights reserved.